Holy Cow!! We made over 85 gallons of soup – curried lentil, potato, minestrone, black bean chili, and squash. We cruised through 11 dozen baguettes, 75 # of jasmine rice, and 60# of carrots. With over 1300 bowls to start, we ran out during our dinner service! When faced with paper bowls people still donated and enjoyed a meal with their neighbors and generously donated! Almost $20,000. Just think of how many people that will feed!! AMAZING! Thanks to everyone who came – and to those who sent their good wishes! I’ll keep you updated on where the $ ends up! This entry was posted in Uncategorized on November 9, 2008 by Jennie. Congratulations! 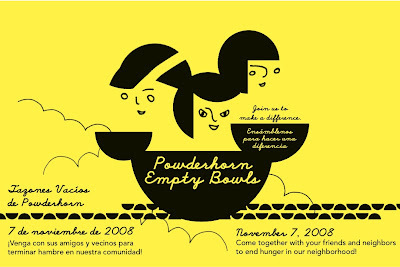 Some of my very favorite bowls are from the Wayzata high school version of this event.